Number one choice for luxury custom wedding cakes in Tallahassee, Florida! How to personalize your next sweet tooth engagement? Since 2011 Artistic Confections has been serving delicious cupcakes, delightful cookies, mouthwatering pastries, and magnificent custom wedding cakes Tallahassee Florida and the surrounding areas. We orchestrate the raw ingredients to compose a mouthwatering symphony of flavors! Our cupcakes, cookies, and pastries are baked fresh daily. Using only the very best ingredients such as vanilla bean, decadent chocolate and garden fresh fruit. Our clients enjoy our attention to detail and the personal touch that we deliver. Every custom experience gets treated to our 5 star quality checklist. - Top Notch Customer Service - Unique and memorable experience - Premium Ingredients - Our dedication to the product - Delicious If we can't commit to those 5 items, then it doesn't come out of our ovens. Three words we use to describe our goods - Unique, Delicious, Perfect. Artistic Confections continues to sweeten the deal by specializing in custom cakes. Creating lasting impressions and delicious memories. Artistic Confections can take your vision from concept to reality. Sometimes you know exactly what you want. Sometimes you need a little inspiration. Visit our online portfolio. Our previous creations will help inspire you. Every experience that comes from our bakery is personalized. No detail is missed and flavor is always top priority. We listen carefully and find the right design for your event. Come with a strong idea or just a few details, and we will create your perfect cake. Consult our flavor list for ideas. Additionally we can tailor the taste for your palate. Seasonal flavors are also available. 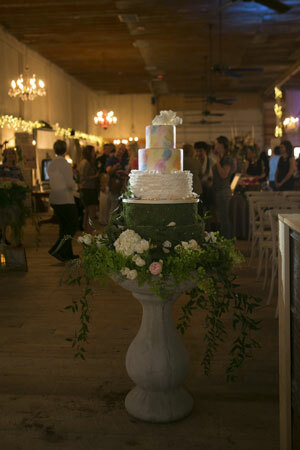 Artistic Confections for sweet treats and custom wedding cakes in Tallahassee Florida style! We deliver cakes both locally and long distance. Send us a message! We also offer catering services in Tallahassee, Florida - Corporate engagements, weddings and social events. Like and visit our Facebook page for more delicious treats. Funny you should ask. 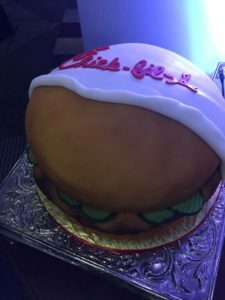 I’m informed that this is not a Chick-fil-a sandwich with pickles, but rather a brilliantly disguised cake with a lovely yellow interior and chocolate frosting. It’s the first cake I’ve ever come across that’s disguised to look like a fast-food product, and probably also the first I’ve seen that’s made up to look like a sandwich.